Modular: This modular unit is ideal for projects where facilities are required inside buildings. Unit contains 2 showers, heaters, water filter system and negative pressure unit. 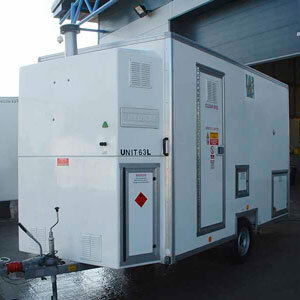 Self Contained Mobile: These set contained towable units provide all of the necessary equipment to decontaminated after contact with hazardous materials. Can be used on any site location regardless of available services. Ideal for use where decontamination is an issue or shower welfare facilities are required.